After the longest partial-government shutdown in U.S. history, Congress came to a compromise on February 14 on funding the entire federal government for the remainder of fiscal year (FY) 2019, which began on October 1, 2018. 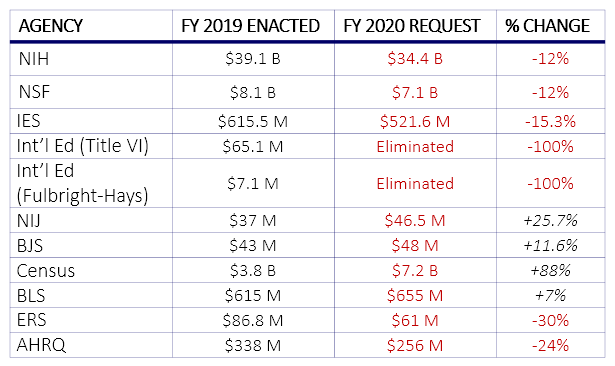 The omnibus spending package contains 7 individual appropriations bills, including the Agriculture; Commerce, Justice, Science; Interior and Environment; Homeland Security; Financial Services and General Government; State and Foreign Operations; and Transportation and Housing and Urban Development appropriations bills. On February 15, President Trump signed the bill into law, closing a painful chapter and officially kicking off work on FY 2020 funding. The final package includes necessary increases for many programs important to the social and behavioral sciences including the National Science Foundation and the Census Bureau. The Trump Administration will soon release its budget request for FY 2020. While the budget will have very little bearing on the funding debates in Congress, it will provide valuable insight into the science policy and funding priorities of the Administration. At the end of the day, the Congress holds the power of the purse and decides the level of taxpayer support for research. Read on for COSSA’s analysis of final FY 2019 funding for the National Science Foundation, Census Bureau, Economic Research Service, National Agricultural Statistics Service, National Institute of Food and Agriculture, Bureau of Justice Statistics, and National Institute of Justice.